We’re all big readers here at the Brampton Inn. In fact, when folks ask us about things to do, we like to remind them that sometimes there is nothing better than pulling a book off of the shelf at random and getting lost in it, either out on the porch, sitting in the sun outside, or, in winter, snuggled up in a guest room in front of a fireplace. 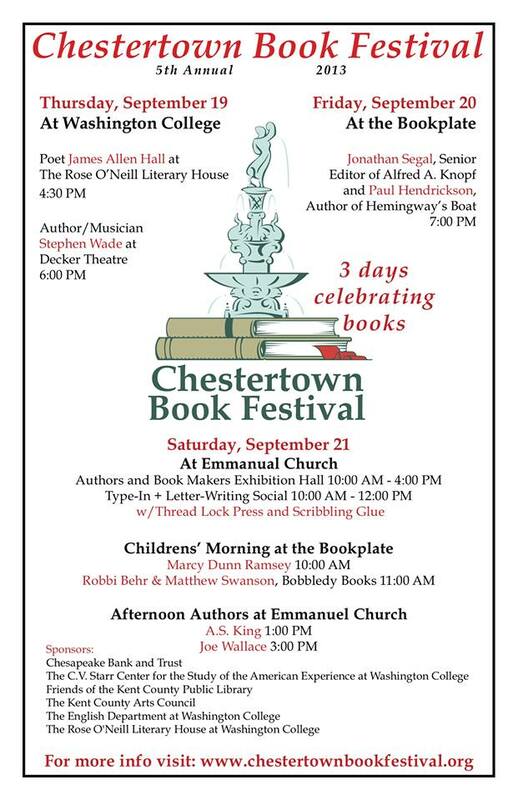 If you like books as much as we do, then you may be interested in visiting Chestertown on September 19th, 20th or 21st. This weekend marks the 5th year for the Chestertown Book Festival: a free, three-day event celebrating the abundant literary life found on the Eastern Shore. Writers, poets, book makers, designers and more from the region come together to share their craft with the public. There will be lectures, dramatic readings, poetry readings, and an exhibition hall with more than 30 participants. Notice on Saturday morning there will be a “Type-In +Letter-Writing Social”…wondering what that is?? Well, if you like typewriters and writing letters, this unique event is going to be right up your alley. Here is a glimpse at the first Type-In that took place in Chestertown last year during the holiday season. Think this is just a quirky Chestertown thing? Think again, and then read this New York Times article from two and a half years ago. Who knew we were just as cool as those hipsters from Brooklyn? Have one of these beauties gathering dust in your attic? Clean it up and bring it to town! You’ll be among friends!!! It’s just another weekend in Chestertown, Maryland: truly a part of the land of pleasant living. We hope to see you in our Maryland bed and breakfast. More than 2 weeks of summer fun left!! — Goodbye Summer, Hello Birds!